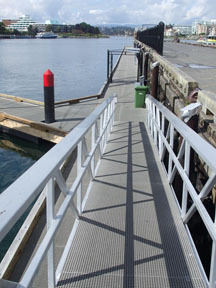 Redco™ FRP Grating provides durability with extremely high strength and stiffness. Due to its high load capacity it can be used with confidence in applications where wide support spans are required. 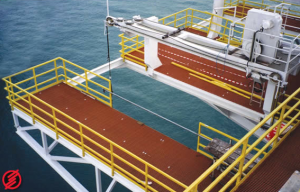 Redco™ FRP Grating is also corrosion resistant and non-conductive making it ideal for applications where electrical current or chemicals may be present. 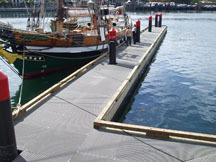 Redco™ FRP Grating is low maintenance with a low cost of installation. Grating varieties available include: DURADEK®, DURAGRID®, DURAGRID® Heavy Duty, DURAGRID® Phenolic, REDCO™ Molded Fiberglass Grating, and DURATREAD™ molded fiberglass stair tread covers. DURADEK® is a standard pultruded grating product that is available with individual bearing bars in either 1″ or 1-1/2″ “I” shapes or a 2″ “T” shape. DURADEK® is a flame retardant product utilizing a polyester or vinyl ester resin. The bearing bars use both longitudinal and multidirectional reinforcements as well as a synthetic surfacing veil to provide unequaled corrosion resistance. 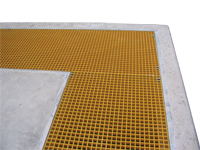 DURAGRID® custom grid and grating systems are designed to accommodate specific applications that cannot effectively be met by a standard fiberglass grating. DURAGRID® offers options such as selection of bar spacing (which creates varying open space in the grating or grid), bar shape, cross-rod placement, custom fabrication, custom resin or color. The bearing bars are assembled into 12 panel sizes; 3-, 4- and 5-foot widths in each of 8-, 10-, 12- and 20-foot lengths. Standard panels come with cross-rod spacings of 6″ or optional 12″ on center. Redco™ Molded Fiberglass Grating is the chemical resistant flooring choice for many industrial applications. The high resin content provides excellent corrosion resistance and requires very little maintenance. The strong mesh grating panel allows efficient on-site cutting to minimize grating waste. Molded grating is significantly lighter in weight than metallic gratings. 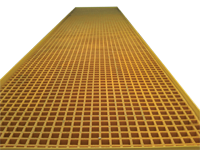 Standard Redco™ Molded Fiberglass Grating has a concave profile on the upper surface for skid resistance. Grit tops (non-slip) are standard. Redwood Plastics offers eight resin systems for its molded grating to accommodate different applications to ensure optimum utilization of grating. DURADEK®, DURAGRID®, DURAGRID® Heavy Duty, DURAGRID® Phenolic, DURATREAD™, and EXTREN® are registered tradenames of the Strongwell Corporation.